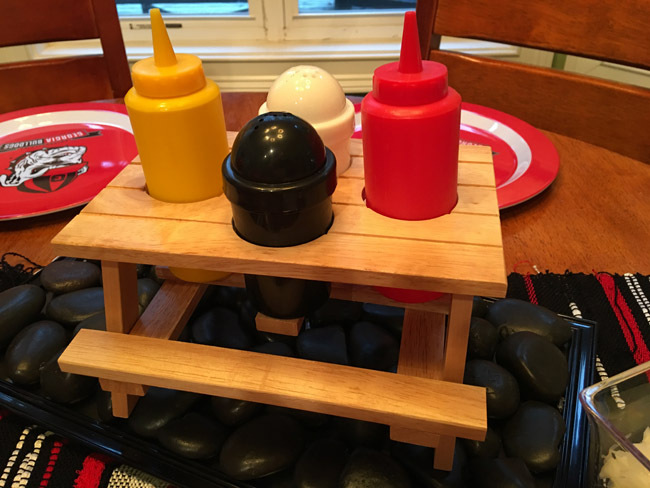 Hot Dog Bar|What are your favorite toppings for a Hot Dog Bar? 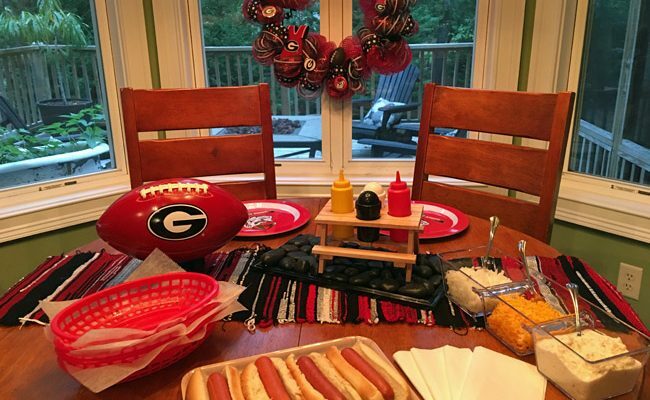 Saturday night UGA football is a good night to make a Hot Dog Bar. It was nostalgic and tasty. I’m typing this post quickly so I can upload before the game starts. I might have to finish on commercials like I did my Halloween decorations. 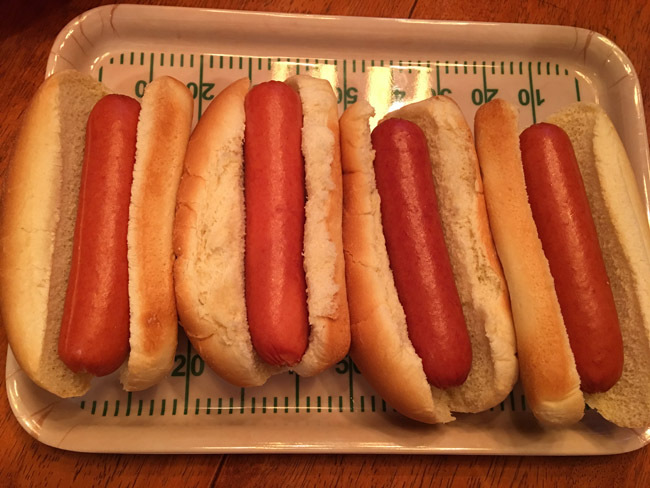 I was excited to find nitrite-free, by-product free, gluten-free, preservative-free, artificial color-free hotdogs by Oscar Mayer for my Hot Dog Bar. They tasted very good and I recommend them. I’m sure many of you, like me, have taken hot dogs off the menu because of all the JUNK in them, so I was delighted to find an alternative to the traditional dog. 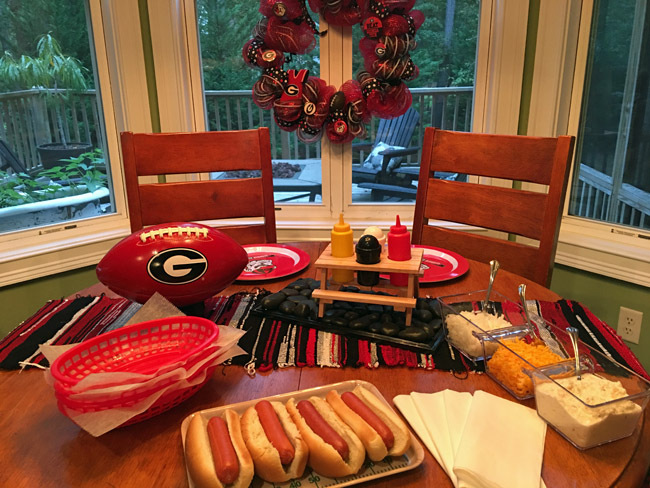 Gina and I made our mesh UGA wreaths last year and my table runner is from my Saori weaving. You can also see my Dollar Tree rock picture frame that I made a week or so ago. All these items made for an easy table setting. I have a lot of opportunity to use red and/or black decorations so I like collecting things in these colors. My high school and college colors were both red and black, my sorority was red and gold (cardinal and straw) and my girlfriend group uses red and black. Good thing I like red and black. I put out our favorite toppers on the table tonight but could have added many more. I like to fix my perfect dog with ketchup and coleslaw. Doesn’t sound very tasty but I like it. Sometimes I’ll even top that with chili and mustard. I’m not a fan of sauerkraut on a dog but I think that might be more of a northern way to fix it. 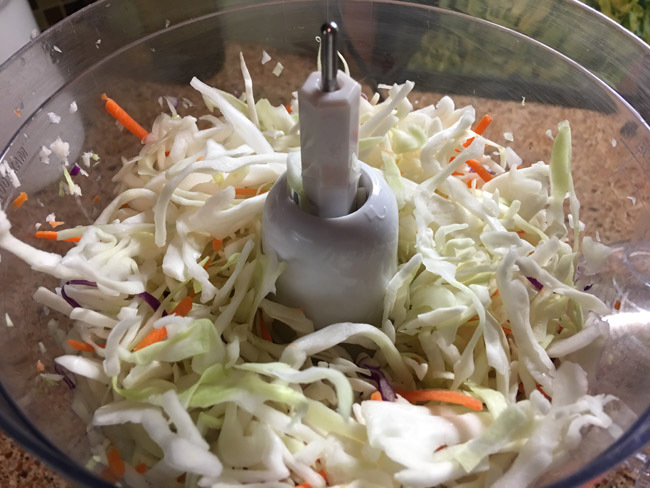 Here’s my favorite coleslaw recipe. 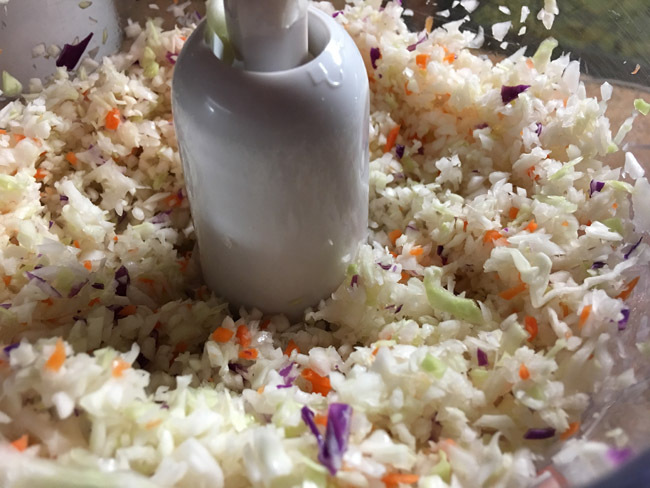 Use a food processor to finely chop the shredded coleslaw; set aside. In a small bowl mix together the rest of the ingredients. Add mayonnaise mixture to the cabbage; stir. Refrigerate for an hour before serving. Before and After giving it a little chop in the food processor. 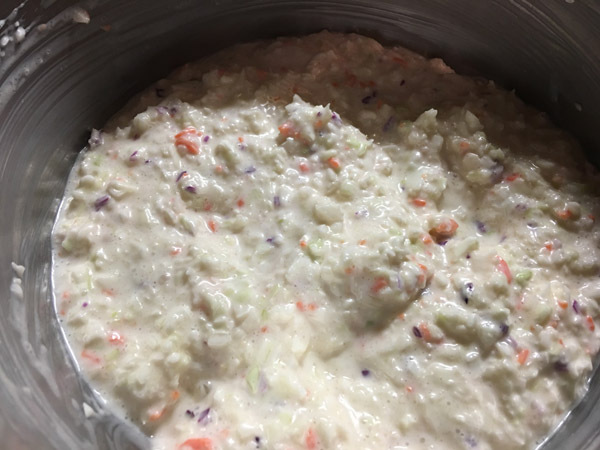 Put the coleslaw in the refrigerator for at least an hour. You want the sugar to dissolve. Now, off to watch the game. You did all that for just 4 hotdogs. 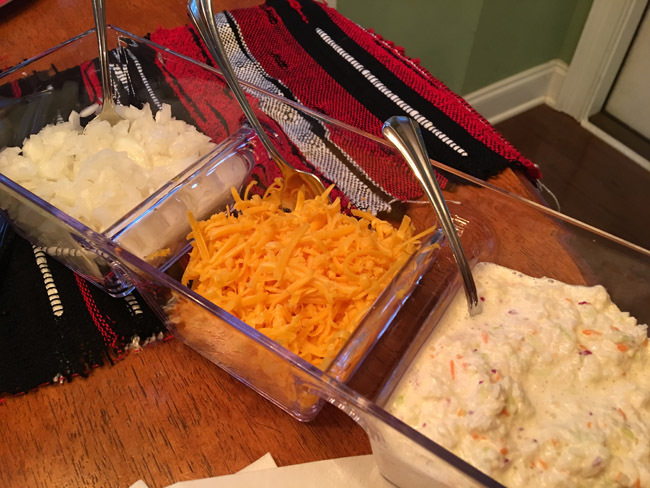 Thanks for the coleslaw recipe. I don’t have one, just mix & taste so it’s truly a hit or miss & often too salty. I did do all that for a few hot dogs. I like table settings and decorating but I have a tiny family and if I waited for a big gathering to decorate, I’d never get to use my pretty things! So I decorate for one or two or whoever is there.